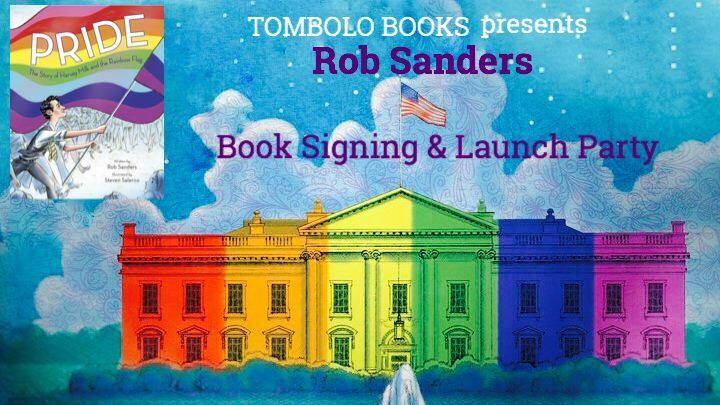 Tombolo Books is proud to be hosting Rob Sanders' launch party for PRIDE: The Story of Harvey Milk and the Rainbow Flag, the very first picture book about the remarkable and inspiring story of the Gay Pride Flag! In this deeply moving and empowering true story, young readers will trace the life of the Gay Pride Flag, from its beginnings in 1978 with social activist Harvey Milk and designer Gilbert Baker to its spanning of the globe and its role in today's world. Award-winning author Rob Sanders's stirring text, and acclaimed illustrator Steven Salerno's evocative images, combine to tell this remarkable - and undertold - story. It is a story of love, hope, equality, and pride. Rob will be joined in conversation with Mellissa Alonson-Teston, Supervisor for Hillsborough County Public Schools’ Reading Coach Project and adjunct instructor in the College of Education at USF. From Central Ave, head south on 22nd St S. The ArtsXchange is on your right between 5th and 6th Ave.
Look to your right for the colorful horses on the Dazzio Art building. On the south side of the Dazzio building turn right into the ArtsXchange driveway. Co-sponsored with Warehouse Arts District, Random House Books for Young Readers, SunLit Fest. For more info on this event, contact TOMBOLO BOOKS (727)755-9456 or alsace@tombolobooks.com.